A very wet walk up to Troutbeck Tongue. Heading down Ing Lane towards the Tongue. Lots of the local fields were flooded (like this one) due to the recent heavy rainfall. Troutbeck Tongue from Ing Lane. Looking up Trout Beck from the main ascent on the walk. The ridge to the left leads up to Hart Crag and onto Caudale Moor. Troutbeck Tongue summit cairn with the valley below leading to Windermere. The summit cairn with a view in the opposite direction. Thornthwaite Crag, Froswick and Ill Bell. Lovely view from the Tongue today even though the weather's poor. A glimpse of Windermere in the distance through the rain. You can see the fields flooded near the village below. 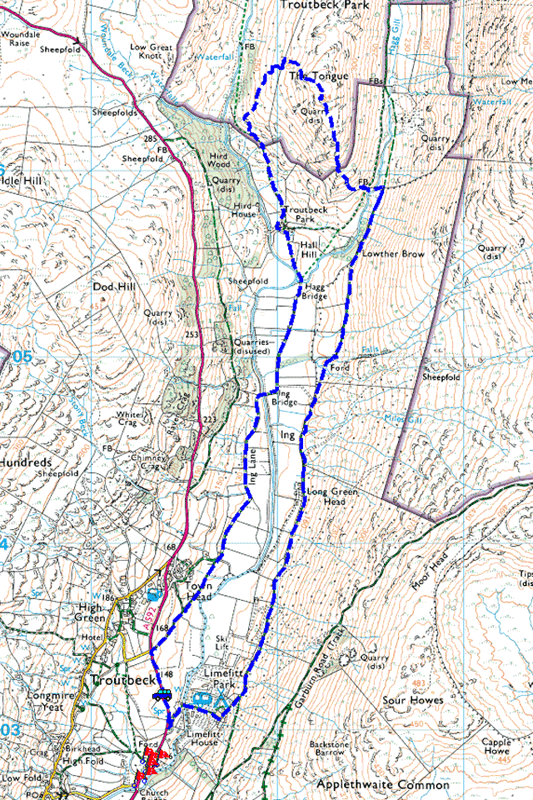 The route we took back to Troutbeck follows the path you can see along the wall to the far left.